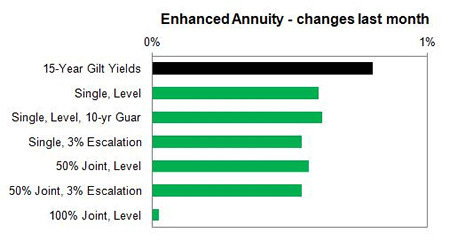 Annuities have been increased by providers following a bounce back from 15-year gilt yields although concern over US interest rates reduced equity markets and yields towards the end of the month. Equity markets have been volatile over recovery fears in the US and Europe which is affecting gilt yields. This has resulted with only a modest increase in the 15-year gilt yields of 8 basis points to end at 2.78%. Standard providers increased their rates on average by 0.98% and we would expect so see a slight decrease of 0.18% in the short term and in the medium term of 3 months annuity rates will decrease by 2.18%. Smoker and enhanced annuity providers increased their rates by 0.53% on average with an increase of 0.27% possible in the short term and in the medium term of 3 months we can expect a decrease of 2.37%. Equity markets started at 6,820 and increased by 198 points to end at 6,622. This represents a 2.9% rise and for people that remain invested will still see a fall in their annuity income as the fall in rates surpassed this figure. 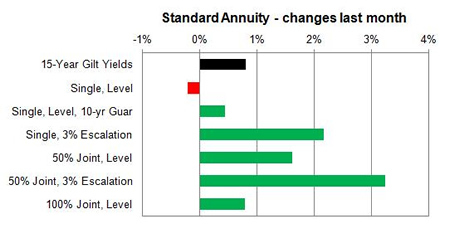 The majority of annuity rates have increased with 80% rising, 4% remaining unchanged and 16% decreasing. Certain annuities have increased by up to 7.5% correcting anomalies in the market as Hodge Life reduced rates several times and other providers were uncompetitive at that time. Virtually all annuities for enhanced and smoker rates increased by modest amounts up to 0.75%. Standard annuities have mainly increased with those aged 70 with single and joint life 3% escalating rates rising by 7.5%. There were a number of decreases for younger 3% escalating rates aged 55 to 60 both single and joint basis.here were also modest decreases for single life rates from aged 65 to 75 of 0.2% and 0.65%. For enhanced and smoker rates there were increases across the board by modest amounts of 0.30% to 0.75%. The only decrease was 100% joint life aged 60 to 65 by 0.75% to 0.90%. For the latest updates see Annuity Rates Review.